Pixie Crunch™ is a modern disease-resistant apple with a really excellent flavor and, as the name suggests, a crunchy crisp texture. Whilst the texture is great, it is the sweet flavor with a slight hint of tartness which leaps out at you and marks this variety out from the rest. There is no doubt this is a very desirable apple. The name Pixie Crunch was chosen to reflect the relatively small size and crisp flesh of this apple. It is smaller than modern rivals such as Honeycrisp, but ideal to eat as a snack on the go. Pixie Crunch makes a great choice for the home grower as the apples stay fresh on the tree for several weeks. Please note that Pixie Crunch is a trademarked and patented variety, and purchasers agree not to propagate or distribute the trees. In addition, customer address details may be made available to the licence holder if requested. 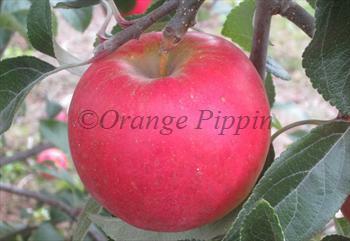 Fill in the details below and we will let you know when Pixie Crunch apple trees are back in stock. Pixie Crunch has excellent scab resistance. However it is best avoided in areas prone to cedar apple rust or fireblight as it is slightly susceptible, although fireblight resistance is improved if using a resistant rootstock (e.g. the Geneva or G-series rootstocks). Pixie Crunch also seems to tolerate warm humid climates fairly well. Try not to allow the tree to over-crop as it has a slight tendency to become a biennial bearer. Harvesting can take place over a period of 2-3 weeks - useful if you like to eat apples fresh from the tree. Pixie Crunch was developed in a breeding program involving Purdue, Rutgers and Illinois universities, beginning in 1971. It was known as "Co-op 33" during this period, and subsequently released under the trademarked name Pixie Crunch. As with most modern apples, the pedigree is complex but several of the crosses involve Rome Beauty, a variety well-known for its good productivity, pleasing clean appearance, and generally sound disease resistance. Pixie Crunch seems to inherit these attractive qualities, but its crisp sweet flavor probably come from one of its other ancestors, Golden Delicious. It has to be said that Pixie Crunch is far more than the sum of its parts, its texture and flavor make this is one of the best modern apples.